Well, no we’re not. We can’t. Even if we wanted to (which we don’t). The Supreme Court just said we can’t. Thank you, NRA and SCOTUS! They’ve trotted out that ridiculous “they’re gonna take away my gun” nonsense so many times, it’s become like kissing babies and eating barbecue: an expected part of every campaign. So thank the heavens we will no longer be subjected to that tired old warhorse. 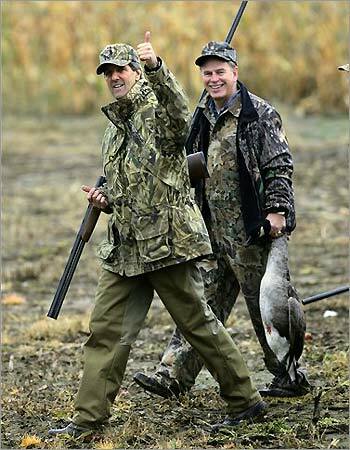 We won’t have to see pictures of Barack Obama trotting through a Midwestern field in a brand-new LL Bean hunting jacket, or wearing hunter orange at some Florida hunting reserve. Democrats don’t do that type of pandering very well, it always rings false–whether it is or not. Chalk that up to another label conservatives stuck us with, despite the fact that there are plenty of Democratic sportsmen and women who love their guns. Now we don’t have to worry about defending ourselves against the stereotype of the anti-gun liberal. It was never true anyway, but now it doesn’t matter. Thank goodness that’s over! Whew. Now we just have to say, “hey, even if we wanted to, we can’t. End of discussion.” The point is moot. That fear-mongering talking point that’s been a standby of every single election since forever? Kiss it goodbye, GOP. It has been effectively retired. I guess that just leaves you with God and gay-hate to hammer your base into the polls from now on, eh? Too bad for you those don’t seem to be working so well lately.